Heat oven to 375 F and spray the inside of an 8″ x 11″ baking dish with cooking spray. If the breasts are uneven thickness, pound them (placed in a Ziploc bag and on a flat surface) to an even ¾”-1″ thickness using a meat pounder. Sprinkle the breasts (both sides) with grated Parmesan cheese & freshly ground black pepper, and place them in the prepared baking dish. 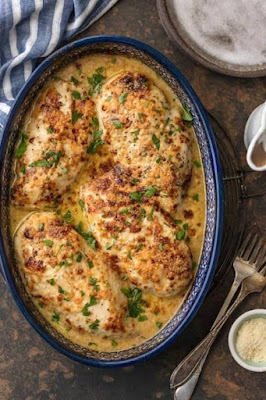 Place the prepared chicken in the oven and bake at 375 F for 30 minutes or until a meat thermometer inserted in the thickest part of one of the middle breasts reads 150°F. Turn the oven to broil and broil the breasts an additional 2-4 minutes or until the chicken turns golden brown. It can burn quickly, so watch it closely. When done, a meat thermometer should register 160 F when stuck into the thickest part of one of the middle breasts. Remove from the oven, cover loosely with foil and allow chicken to rest 5-10 minutes before serving. 1. Preheat the oven to 350 degrees F. Lightly butter a deep 2 1/2-quart casserole. 2. Bring the large pot of salted water to a boil over high heat. Add the oil, then the elbow macaroni, and cook until the macaroni is just tender, about 7 minutes. Do not overcook. Drain well. Return to the cooking pot. 3. In a small saucepan, melt eight tablespoons of the butter. Stir into the macaroni. In a large bowl, mix the Muenster, mild and sharp Cheddar, and Monterey Jack cheeses. To the macaroni, add the half-and-half, 1 1/2 cups of the shredded cheese, the cubed Velveeta, and the eggs. Season with salt and pepper. Transfer to the buttered casserole. 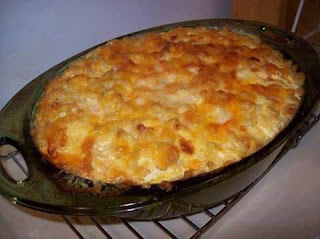 Sprinkle with the remaining 1/2 cup of shredded cheese and dot with the remaining one tablespoon of butter. 4. Bake until it's bubbling around the edges, about 35 minutes. Serve hot.